Why have I stopped receiving notifications from Process Scheduler that the backup completed? This may occur if the admin password for Sage was changed. Verify the last time the backup was successful then check to see if the Admin password for Sage was changed. How do I find a list of cheques / payments that were issued? This will display a list of cheques. You can scroll through this report or select the option to Print (button on bottom left of window). This will give a list of all cheques issued. 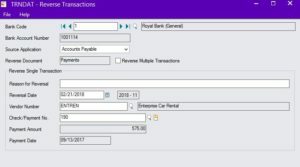 How do I reverse a payment in Accounts Payable? Go to Common Services – Bank Transactions - Reverse Transactions (see screen shot below). 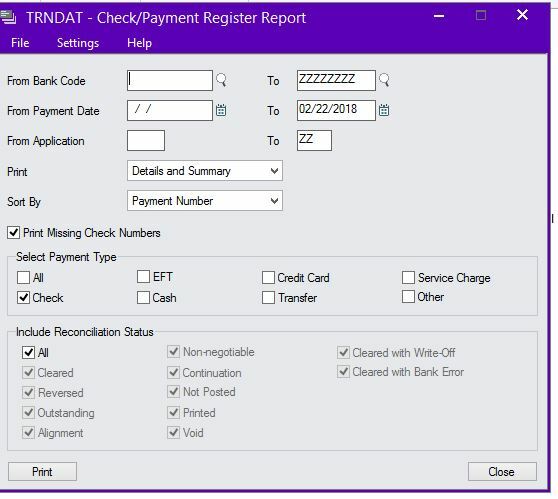 To reverse just one cheque, select the source application and do not place a check mark in the reverse multiple transactions box, you can then type in a description and select the Vendor and then cheque to be reversed. Changes are made when you select the post button. When you reverse a cheque, it reverses the entries that generated the cheque in the appropriate subledger, and sends a batch to GL. For example, when you reverse and Accounts Payable Vendor cheque, it will update the vendor file and make the invoice(s) available for payment again. If the invoice is not going to be paid then a credit note needs to be issued against the invoice. 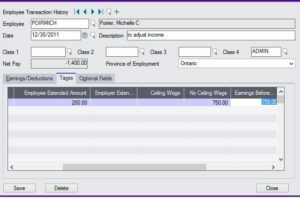 In Payroll, the employee’s file is updated and the Payroll register is updated to reflect the reversed cheque. 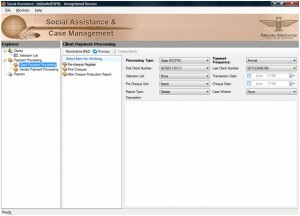 How do I setup recurring payables? Select the recurring payables icon from AP Vendors. Type in an expiry date, if required. If there is a maximum amount to be invoiced enter it in the max. amount field. The Vendor will not be included in the recurring payables batch once the maximum has been reached. Leaving it at $0.00 means there is no maximum amount to be invoiced. Enter a description for this vendor’s recurring payable. This description will become part of the invoice batch that is created. Select the appropriate terms code for this Vendor’s recurring payable. Enter a PO and Order number if required. On the detail tab, enter the GL account distribution details and amounts. Review and change the tax information on the tax/totals tab if required. Return to the Vendor number field and select the next Vendor to be part of this recurring charge code. Change any information as required on the invoice tab, and enter GL distribution information on the detail tab and add this Vendor to the recurring charge. Repeat the 2 steps above until all Vendors required are part of the recurring charge code. 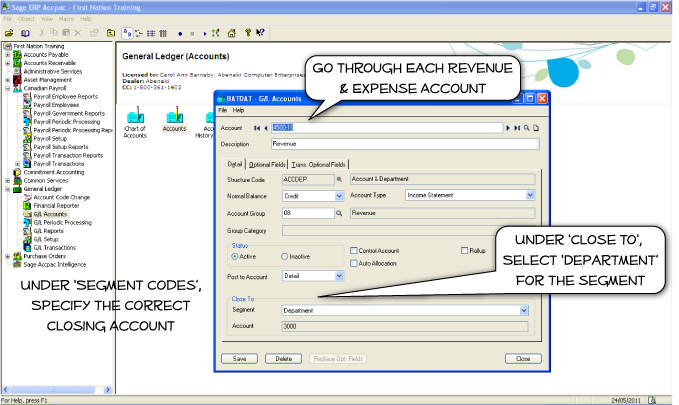 There are 2 ways to create a recurring batch in Accounts Payable. If the schedule you are using for the recurring charges also included a reminder list then when you sign into Sage Accpac, a reminder list will appear. You can select the recurring charge and then select the process button to have an invoice batch created for you. 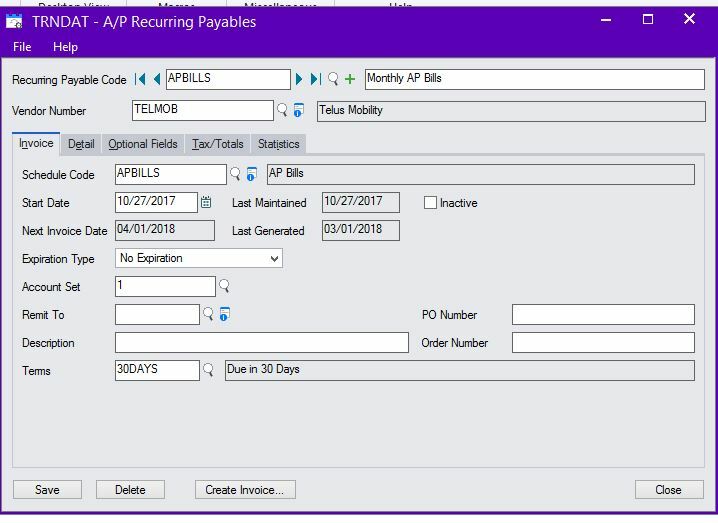 If the schedule does not contain a reminder list, you can create the recurring payables batch from the A/P Periodic Processing menu and then selecting the create recurring payable batch icon. Select the correct run date and range of recurring payables to process and then select the process button. An AP Invoice batch will be created. 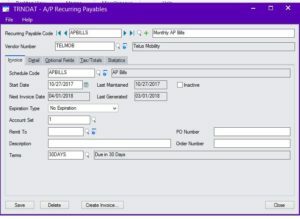 The AP Invoice batch can be modified to include any additional entries or entries in the recurring batch can be modified and deleted. Do not delete the recurring batch unless you are absolutely certain as you cannot create another batch for the same run date a second time. What are the numbers at the bottom of the Vendor cheque and what do they represent? How do I reverse Customer Payments? Reversing customer payments is performed in the bank services module. 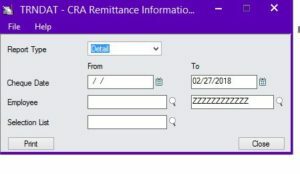 Since AR sends information related to deposits (receipts) and cheques (refunds); both of those types of transactions are available for reversing. As with any other Accpac Module, dates are important to verify when you are reversing items in bank services. You may need to reverse a customer payment for a number of reasons including the payment did not clear or it was entered/recorded to the wrong customer account. 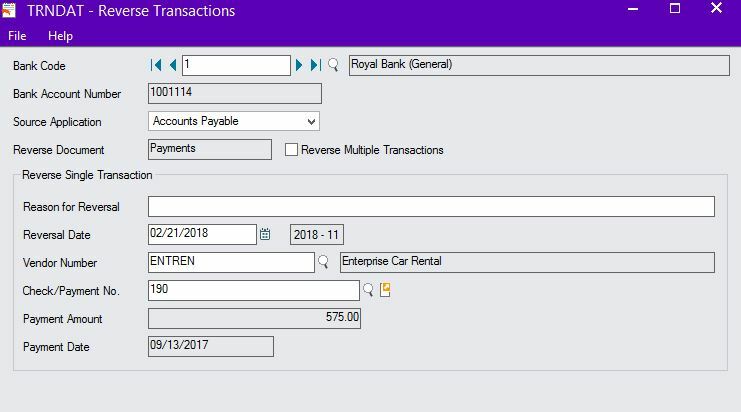 To reverse the customer payment, select the Reverse transactions icon under Bank Transactions in the Bank Services module. During the process of bank reconciliation, it is possible that you find your bank reconciliation book balance does not agree with the GL bank account balance. How do I get a report that shows all cheques created? Is it possible to reverse an Entry in Bank Services? Yes, in version 5.6 and higher it is possible to reverse cheques and bank transactions, as long as you have not cleared them in a posted bank reconciliation. 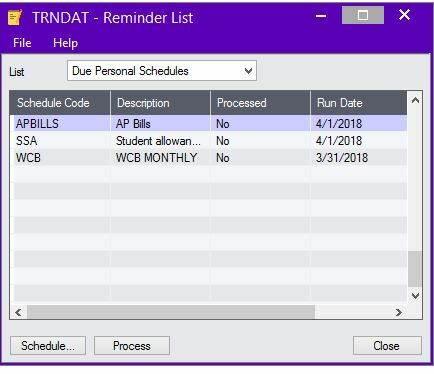 Select the reversal date, and fiscal year and period (this is important, as the reversal date and period will determine which bank reconciliation the reversed transactions will show in. Every time I post a batch in GL, an Error batch is created...Why? Error batches can occur in the General Ledger for a number of reasons. The most popular time of year for error batches to be created is in the first month of your new fiscal year; which is April for most of you. The error batches occur because the New Year has not been created in the General Ledger. Once the new year has been created in GL, then you can edit the description of the error batches and then post them. If error batches are still being created, check the posting Journal error report for further details. 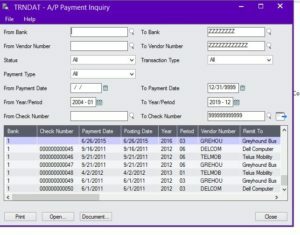 How do I create a new year in Sage 300 ERP General Ledger? Go to General Ledger, GL Setup, Options and select the Posting tab. Verify that the number of years’ transaction history to keep is greater than 1. Some versions of Sage 300 may only allow you to keep a minimum of 7 years of history, while other versions will allow you to retain up to 99 years history. Once you confrim the # of years of history you are keeping and if you are at your limit we can assist you in setting up a historical database so you will have it available for inquiry purposes for prior years' data. Verify that the Create New Year function has not yet been run by verifying that the current year showing is the actual calendar year (for example: if the current date is March 31, 2016 the current year showing would be 2016). Next, select Periodic Processing, Create New year. You will have a warning to backup prior to proceeding. DO NOT IGNORE THIS WARNING! As long as you have done a backup, select “Process”. I created my new year and some accounts closed to the incorrect closing account, how do I correct this? I have error batches in GL, how do I find out what the error is? Go to GL reports then GL posting journals and then select posting journal errors for the batch in question. What do I do before creating my new year in General Ledger? Creating a new year in General Ledger will create and post a batch to take the revenue and expense accounts (designated as Income Statement Type of accounts) to a $0.00 balance for the beginning of the next fiscal year. All of the details will remain in the previous year history file. Run a data integrity check on all modules. Print and keep the report. Print a chart of accounts and verify that you have at least 1 account designated as a retained earnings or closing account. You must have at least 1 account that is account type “R” for Retained Earnings before you can create the new year. In your printed chart of accounts, verify that all accounts that are revenue and/or expense type of accounts have been designated as “Income Statement” type of accounts. Accounts that are mistakenly defined as balance sheet accounts will have their balance carried forward to the next year. If you have more than 1 retained earnings account, and you have departments that close to different retained earnings accounts, make sure the correct closing account is specified for each department in the segment codes in GLSetup. Related to #5 above, for each Income Statement type of account in General Ledger, make sure there is a value in the Close To field for each account. This value is usually defined as either department or program. You will have a pull down list available to select from. Without this specified at the account level, the account will close to the default retained earnings account defined in GL Options. Why can I not see all the batches listed in the batch list window? If you are working in the GL for example, open the batch list window check to be sure the source ledger is blank, this will allow you to see all the batches from all the ledgers listed. Also check to be sure the check mark is on show posted and deleted batches. Why is my Sub-ledger control account(s) out of balance with GL? Be sure that your control accounts are configured with only the sub-ledgers through which the transactions should be routed. Be sure not to assign GL for this type of account. Configure your sub-ledger’s GL integration settings in a way that an easily recognizable field such as vendor/ customer number and document number is linked to the GL detail reference and description fields. 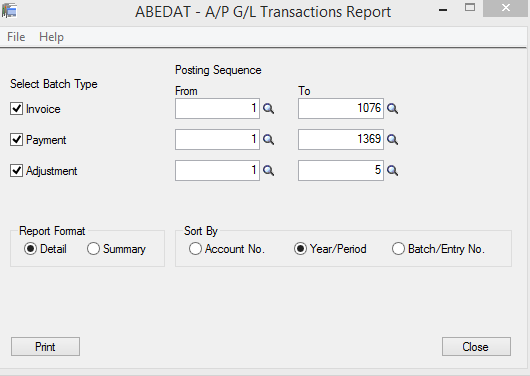 This will make it easy to identify AP/AR transactions in the GL Transaction Listing Report. Check if there are any direct Journal Entries posted to the Control Accounts. This can be checked from the Account History Inquiry by selecting the source code as GL-JE. If yes, it needs to be reversed and posted from the respective sub-ledgers. 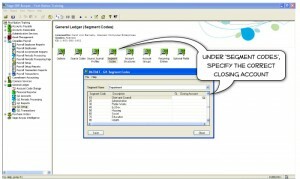 Check if there are any Error batches created in GL or sub-ledgers in the Batch List. If yes, print the AP Posting Errors report then check and correct such batches. Verify that all batches posted from Sub-ledgers are also posted in GL. You can check this from the GL Batch List by un-checking the option Show Posted and Deleted Batches. Then post the necessary ones. Run Create GL Batch from Periodic Processing from each sub-ledger to ensure that the batches have been sent to the GL and check if it makes a difference in the balances. You may need to run Day End Processing in some modules such as Purchase Orders. Run GL Transaction history for the control account and check if there any entries originated from some other sub-ledger. For example, if you are reconciling AP-GL select the AP control account for which there is a difference and check if there are any entries from other sub-ledgers(other than AP or Bank Services). 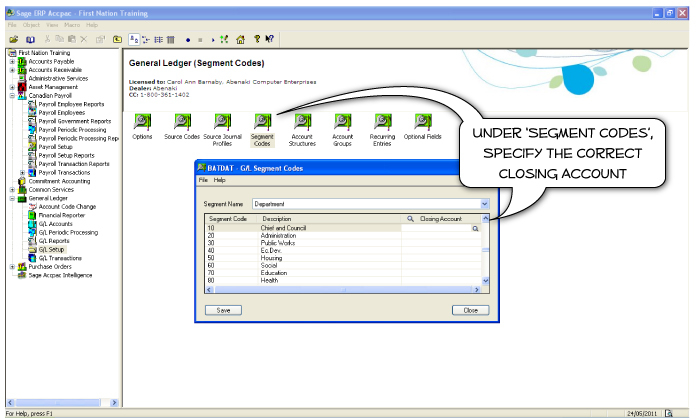 Find out the last time the Sub-ledger control account(s) balanced with the GL. Use this as a starting point to begin your reconciliation. 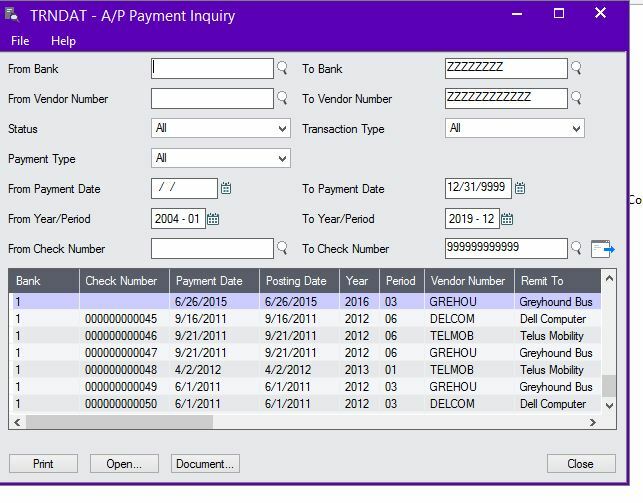 Once you print and export, it will provide the details of AP transactions sorted by year-period. Take the transactions of the period you are getting the difference. Export the GL Transaction Listing report for the control accounts for the same year-period. Cross check the transactions in both the sheets using comparison formulas in excel. This would give you the details of those missing transaction either in AP or GL. 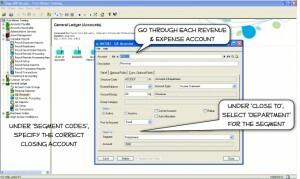 Once you have the list of missing transaction, you will be able to correct the imbalance by making proper adjustments. A user accidentally deleting a sub-ledger batch from GL can be a reason for the difference. Check to verify that no batches with a sub-ledger source have been deleted. If the posting date of the sub-ledger document is different from the GL posting date, the result will be a discrepancy when reconciling as of a particular date or period. For example, if an AP Invoice is posted in the April and the same document is posted in GL in March (back-dated) then the result would be a difference when the reconciliation cut-off date is March. The changing of the GL Accounts from the original Control Account to another account, or changing transaction dates in the entry that has been sent to GL prior to posting the batch in the GL might also be one of the reasons. 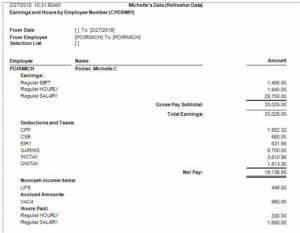 After printing payroll cheques I realized one employee was paid the wrong amount, I have to generate my EFT file and send to the bank right away how do I correct this so the EFT file I generate is correct? Next go back and make sure the employee’s pay tab or timecard is correct. 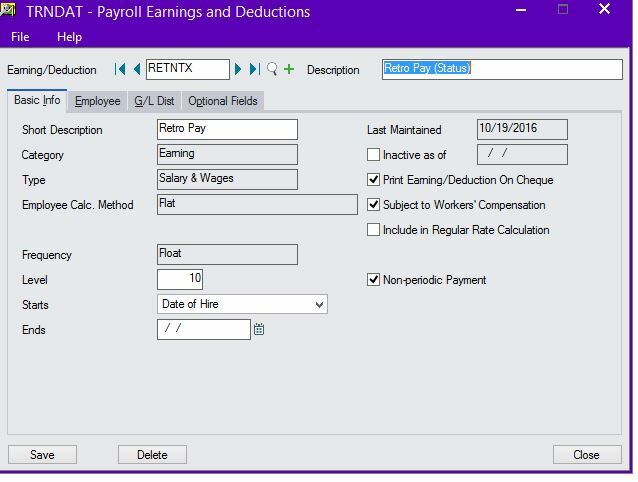 Then you can re-calculate payroll for this one employee only using the same pay period end date then process this new calculation of payroll. Next verify your pre-cheque register and proceed to print cheques then to generate your EFT file as normal. If you have to calculate payroll for one or more employees, for example, that have earned severance pay or a lump sum payment (not a regular payment) keep in mind you should add a new earning and check the box that says non-periodic payment. Making the earning a non-periodic payment will reduce the amount of income tax deducted. Without the check mark in the non-periodic payment box, the system will think the employee is getting that amount of pay now on a regular basis. But with the check mark in , the system will know that it is not a regular payment. Can I print T4 Forms on Plain Paper? 2) Be sure that you have the province in both the Employer Info and Transmitter Info 1 Screens and you also need to have the contact name, phone # and email where it is requested. 3) You need to enter something in the SIN of 1st Proprietor field or it will not process the file. You can use zeroes. 4) Fill the Transmitter Info II screen out as per above ... the MM number was something CRA was testing but are no longer using, so you just fill the rest of the field with zeroes. The Submission reference ID is one you decide on. You decide on the location of the file by browsing. If you have more than one RPP # you can include the info in the file, eg: T4EFILERP0001. 5) When you get to the CRA site, you select T4/T5 by Internet then Filing a T4 Information Return, then Internet File Transfer (XML), FILE NOW, Enter Secure site. 6) After clicking on the I agree button, you will see a screen where you enter your RPP number or MM #. Since the MM# does not exist, enter first your RPP # then further down there is a spot to enter the Web Access Code you were given by CRA. 7) Click the continue to next step button at the bottom of the screen and then select the file you saved in # 4 and upload it. 8) If the file was transmitted successfully you will receive a display telling you that the upload was successful. This will confirm the number of T4 slips, date and time and will give you a confirmation number. Be sure to print this page for future reference. Repeat the above for each RPP # you have. How do I download & install the January 2016 Payroll Tax Table Update? 1. Make sure all users have exited the program. 2. Backup your Sage 300 databases (database dump), for all databases as you may have more than one. 4. Log onto the Sage customer portal to access the latest updates. Choose the update appropriate for your company and click ‘Get the Update’. [Please note to log onto the Sage Customer portal click here: https://customers.sagenorthamerica.com/irj/portal/anonymous/login . If you are unsure how to login or if this is your first time logging in you can contact Sage directly: 800-253-1372 choose option 3. 5. Once the download is complete, double click the file to begin the installation for the update and follow the instructions on the screen. 6. Now you can open Sage 300 and activate the January 2016 tax table you just installed. To do this, sign in as the Admin user and go to Administrative Services and click on the Data Activation icon and select the Cdn PR Tax Update for January 2016 item, then click activate. 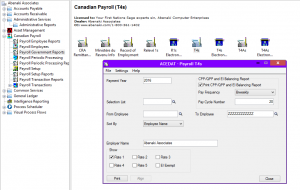 You may also be prompted to activate Payroll Version 7.2 again. 7. Repeat Step #6 for each set of data you have. You may have other procedures that you routinely perform as part of your first January payroll. These steps could include updating Worker’s Compensation rates, and other employee related information. We suggest you consult your own internal procedure checklist as well at this time to ensure everything is completed. How do I Electronic File my T4? 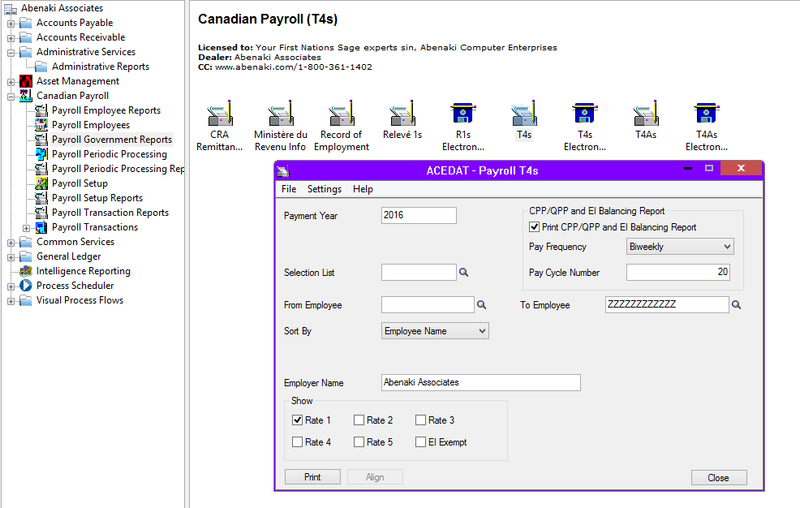 Step One - Select "Payroll Government Reports"
PLEASE NOTE: Your file will be saved in the location you define in "Local File Path"
Step 3: Fill in screen as per CRA requirements. See our other FAQ on this. How do I find out how much has to be paid to CRA? 4. Select a date range corresponding to your filing period. For example, if the last payment included paycheques up to the end of November, then select Dec. 1-now as the date range. 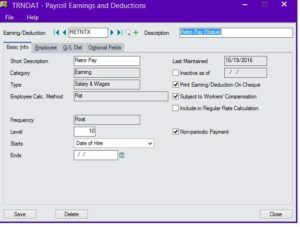 How do I make an adjustment to Box 14 Employment Income on a T4? 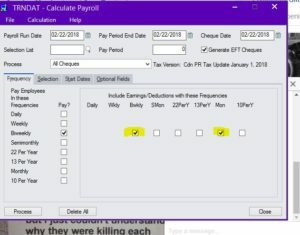 Go to payroll employees, transaction history adjustment, choose an employee and create an adjustment and on the taxes tab, choose INCTAX, you just add the amount you are out (‘-‘ to decrease the amount and ‘+’ to increase the amount) to the earnings before deductions field to get the amount to adjust /change in Box 14. I generated my EFT file and realized it is not correct, what should I do first so I can regenerate the correct file and send to the bank? Simply reverse the cheques and start over. I have a copy of an employee’s cheque to use for Direct Deposit (EFT), what are the numbers on the bottom of the cheque and what do they represent? I have updated Employee Information, but the new information is not showing on reports? A: During the course of running your payroll system, you may update or correct employee information. This information may include the employee hire date, cost centre (department) and WCB information. The employee hire date is located on the General Tab of the employee information. This information is also contained on the employee’s pay tab, and it not updated automatically after a change is made in one of these other sections. This information is also on the employee Pay tab. If you make changes to the hire date, WCB and cost centre fields after filling in the pay tab, you should go to the employee pay tab and check out each of the earnings and deductions, and make the changes there also. Each of the earnings and deduction detail lines also have fields for start date (which is usually the hire date), WCB and cost centre override. 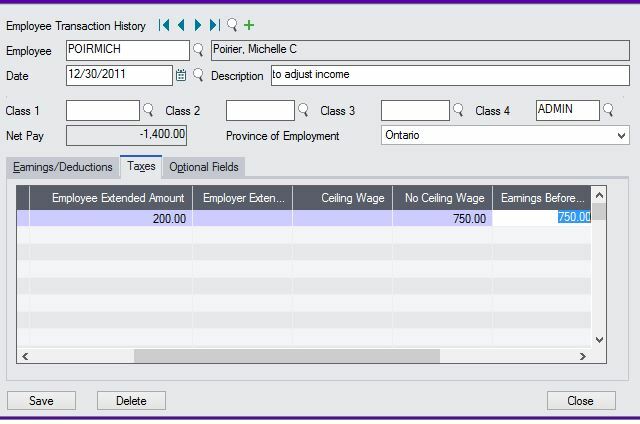 If these fields have been changed in the sections of the employee information, you must also change them here on the pay tab to ensure correct reporting. 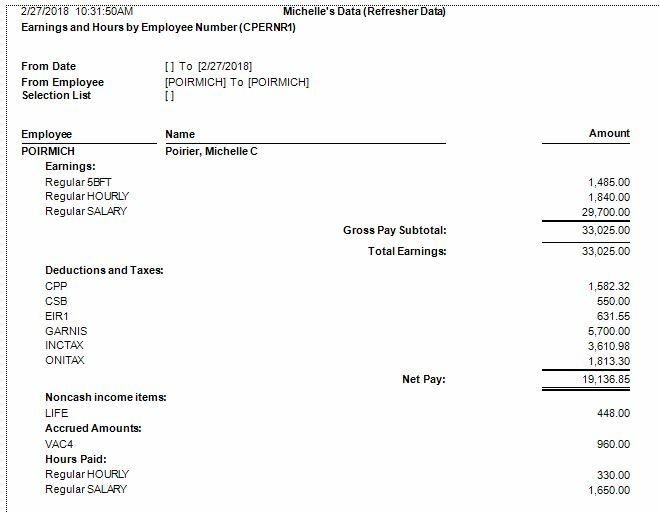 I need a payroll report that shows total earnings and deductions for each employee by date, what report would be best? The Payroll Earnings and Hours report would work best, it is located under Payroll Transaction Reports. You can set your report criteria by date range, detail or summary format, and for all employees, a selection list or for just one. When calculating payroll for an employee with a bi-weekly pay frequency for example, and they are also receiving a monthly earning such as a travel allowance that is paid out to them at the end of each month you will calculate payroll by choosing the pay frequency biweekly and under the section “include the earnings / deductions with these frequencies” check the monthly check box (Mon) – like the screen shot below. The latest Payroll Tax Table update (January 2016) included a changes to the ROE form. One of the changes is that you are no longer able to print the ROE in Sage. This is to comply with the new requirements from Service Canada that they be printed from their website. Where is the Pension Plan number (Box 50) entered? Box 50 would have to be entered on the employee record for each employee that pays into the plan on the Class/schd tab the field called RPP number. Why are the CPP & EI exempt boxes incorrect when printing a T4 using the Laser Form for Employees? Sage is currently working on a fix but in the meantime, a workaround is to use the Plain Paper Form. Why are the EI / CPP / insurable earning boxes blank on the T4? Why is my PIER Report not printing the correct amount? 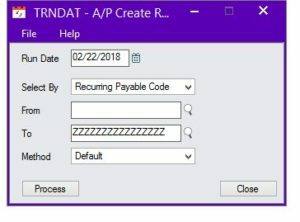 You need to be sure to enter the pay cycle number (pay cycle number is the payroll period number for the year indicated) in the field under the pay frequency then regenerate the report. Why is the business number (Box 54) not printing on the T4? The business number can be setup under payroll setup then income taxes and choose each tax that you have setup and add the Reporting ID (Business number). Note: This will not show up on the employee's copy of the T4. Why is the employee's return address not showing up on the T4? Don't worry, it isn't showing up because it is not required on the T4. Why is the Pension Adjustment (Box 52) not showing up on the T4? Box 52 would have to be setup as per the attached instructions. Why is the Pension Plan (Box 20) not showing up on the T4? Box 20 does not show up for Status employees. I am receiving error=2, what should I do? This means that Accpac is not communicating with Pervasive, which would normally mean that the connection has been lost, Pervasive Services needs to be restarted - which restarting the server or workstation would do, however a technician would be able to go into Pervasive services and do that manually as well. How do I do a DBDUMP? I noticed I cannot keep more than 7 years of history, how can I change this? If you cannot change the # of years to keep history this means that you are at your max for data retention, you should make a duplicate copy of your database (do a database dump / backup) this way you will have the history up to the point prior to creating the new year. What is a database dump? A database dump or DBdump, is a backup copy of your Sage database(s). Typically a dbdump is performed on each system and company database as part of month end or year end, and can also be run daily. How do I add a person? 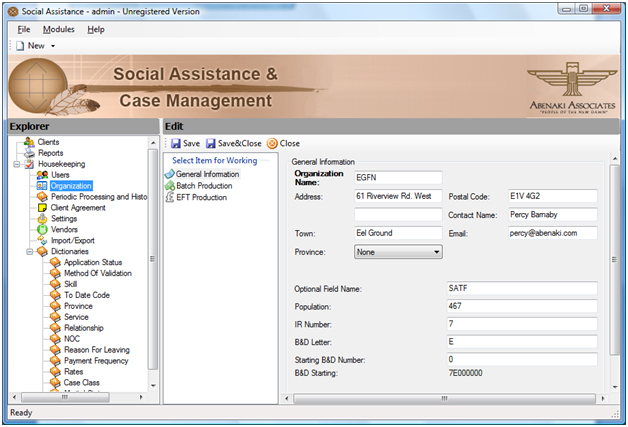 To Access the Add People menu option you must sign in as the Clerk type user to add a new person. In the window on the left select Add People from the People menu option list. On the right the Add People window will appear, once the person’s detail tabs are completed click the save button. How do I attach a picture? How do I create / add a new user? To Access the user maintenance screen you must sign in as the administrator type user. Select the System Access menu option from the window on the left. Then click the Add User menu option. From the window on the right complete the user details, once all the fields are completed, click on the Submit button. How do I exit the program? To exit the CMIS go to the file then exit, or press the “X” at the top right corner of the screen. 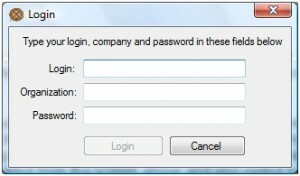 To Access the Report menu option you can log into the computer as any type of user. 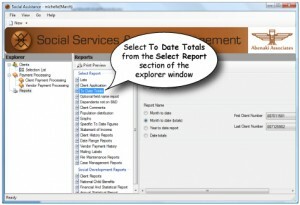 Each user type has the ability to print reports. From the window on the left click the Report you wish to view from the Report menu list. The report will be generated on your screen first. From the Report window on the right choose your search criteria and click on the search button. Your search results will appear in the window below, next click on the Display Report button on the bottom left. You can then select the printer icon to send the report to a printer. You can also select the disk icon to export the report to a file. The file could be a Word, Excel or PDF file. Can HIMS be installed in a network environment? Yes you are able to install HIMS for a network environment and as a “server” on a regular workstation, but before installation you must first ensure that your systems meet or exceeds all recommended requirements. What type of report formats can I print from HIMS? In addition to generating a “paper” version of your report, you are also able to export or send your HIMS reports as a *.pdf, *.txt, *.doc, *.rpt and as a *.xls file format. Why is HIMS restricting me from uploading images larger than 2MB? HIMS will not allow the end user to upload images larger than 2MB. This is done to minimize data space and keep the program running at an acceptable speed. Many digital cameras allow you to define the resolution / size of your photos - changing this setting can help reduce file size. Will HIMS backup my data automatically? HIMS does not perform automatic data backups, however the system will allow you to backup your data and store it in a specific location of your choosing. Backing up your HIMS data is easy to do whichever backup utilities you use i.e. backup CD, external HD, or thumbdrive. This practice will ensure that your data is secure. Will HIMS run on Win8 operating system? Windows 8 (as well as previous version of Windows to Vista) will all support HIMS. To avoid any complications we strongly recommend that you download the updated patches, and upgrades. Will HIMS work on my Apple devices? Yes! The Web version of HIMS works beautifully on devices such as the iPad and iPhone, which makes it a great tool for inspectors working in the field. A student is not showing in the pre-cheque register that should be? Verify the student is entered into the system. Verify payment details exist for this student. Verify that the student’s status is approved active. Verify that the student has payment details for the payment frequency that you have selected. Can the program be used by multiple users? Yes, if you are networking the program and installing it on a server. You must meet the minimum system requirements for the Server (Question 3) and networking (Question 4) to ensure the program functions properly. How do I reverse cheques? Select ‘Periodic Processing and History/Reversal’ option from the list on the left hand side of the screen. Select the History/Reversal option from the periodic processing menu. If logged in as admin: Select your organization (in place of default). Select the ‘Is Vendor’ box at the top of the right hand screen if reversing a vendor cheque. Select the cheque to reverse, by using your mouse to highlight the number. Select the ‘Reversal’ button at the top of the screen. The status of the cheque will change. Select the ‘Print’ button to print a report to confirm that the cheque has been reversed. I cannot see any cheques listed when I go to history/reversal. In order to for cheques to go into the history you have to delete the cheque batch from ‘After Cheque Production Report’ under Student Payment Processing. You will have to be logged in under Standard User to access this. Is the Post Secondary Student Management system networkable? Yes, PSSM can be networked as long as you have a Network Interface Card for your system. Ethernet 100mbps interface cards and hubs installed in the Server and each workstation are the minimum system requirements to have the Education program networkable. For each additional user, Lanpak licenses must be purchased. The pre-cheque register is missing some/all clients. When setting up rates as Admin ensure you enter a max range higher than $0. Enter in an amount that is higher than any payouts you have set up for your students. The end date of the rate should also be completed with a date for as late as possible (i.e. Dec 31, 3008). This will avoid you having to update the end date frequently. The ‘Create Batch’ button is greyed out even after I have done a pre-cheque register. The 'Create Batch' button will only be available if the pre-cheque register report contains no errors. View the report and fix any errors that are listed. When producing vendor cheques, “No vendor is assigned” appears. Do I add a vendor? Go into housekeeping and then select the ‘Vendors’ option on the left hand side of the screen. Click ‘New’ at the top of the right hand screen and enter the appropriate information about the vendors. Will the program run in a Windows 2003/2008 Server environment? Yes, the server minimum requirements include: Pentium 4, 4 GHZ, with CD /DVD ROM drive, 4 GB of RAM (Required for network installations only). Server Operating System: Windows 2003 or 2008 Server with all the latest service packs. (Required for network installations only). Will the software run on a Windows XP, Vista, Windows 7 / 8 operating systems? Yes, PSSM will work with Windows XP Professional Operating system or Windows Vista (32bit) as well as Windows 7 and 8. How do I edit an existing user? 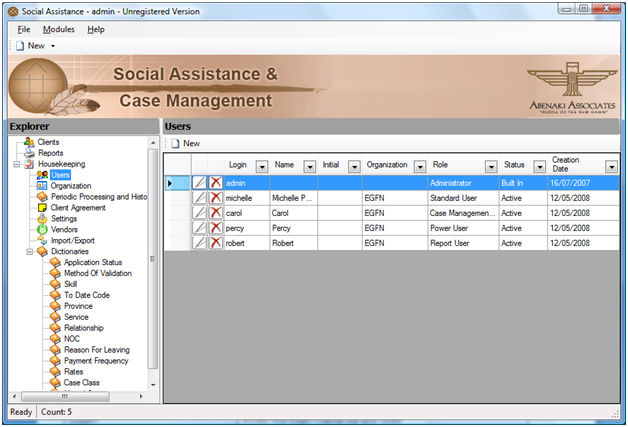 To modify or edit an existing user, select the users menu option form the Housekeeping menu on the left. A list of users will be displayed in the window on the right. Select the user to edit by selecting the pencil type icon next to the name. Make necessary changes and select the save and close button. 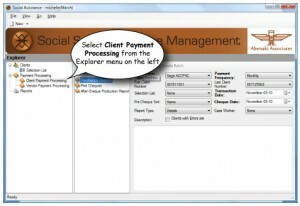 How do I perform Client Payment Processing? Select Client Payment Processing from the Explorer menu on the left. If this is not your first run, you may need to select the re-initialize B&D button. Selecting this button will bring all of your clients that have a check mark in the Re-initialize B&D field on their B&D screen. This step is optional and depends on your situation. The processing Type (batch type), is set by the administrator, and should not be changed unless consulting with them first. The first and last client number fields will be filled in with the first and last clients in the database. You can change these to select a narrower range of clients to include. If you have created selection lists, you can pick it in the Selection List filed. The transaction date will default to today’s date, but you can select another date. It becomes the posing date in the payment batch, if you are integrating with Sage Accpac ERP. The cheque date will also default to today’s date, but it can be changed to reflect the date that you want on all of the cheques. 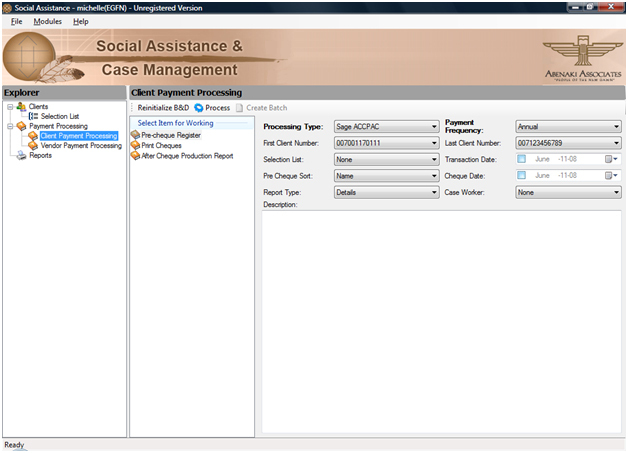 The Caseworker field can be used to filter the pre-cheque register by a specific caseworker. None, means that all this filter is not being used. If you place a check mark in the box, clients with errors are ignored, then if the client records contains any errors that would prevent a cheque from being issued, they will be ignored on the report and subsequent batch creation. The Description area is used to enter a brief description about this cheque run. 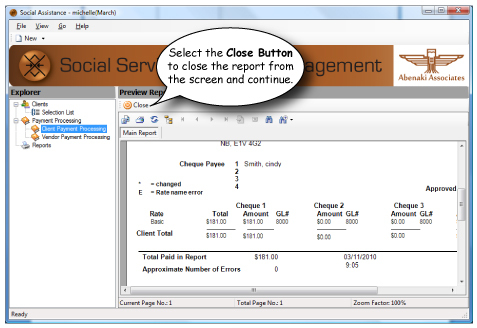 The process button is used to generate the pre-cheque register report on your screen. Once the report is generated on your screen, you can select the printer icon to direct the report to a printer. Select the close button to close the report from the screen and continue. If the report is empty, or contains errors, or you are missing clients, you may have to go back and look through all of the selections made before the pre-cheque register was generated and select different options. You may also have to go look through the client’s file and payment details to see why they are not included. Double check if you BACKED UP YOUR DATA? The next step would be to create the batch, by selecting the create batch button towards the top of the screen. Once you select that button, you must then confirm that you want to create the payment batch. The next message that will pop-up will indicate how many batch files were created. Your next step is to select the Print cheques button. You will see a list of batches in the window on the right that are available for processing. 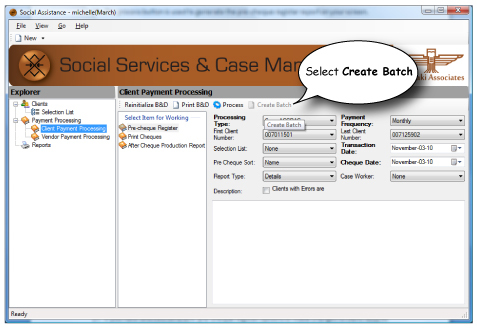 If your batch type is Sage Accpac, this step will assign control numbers to the payments. Cheque numbers will be assigned in Accpac. Make sure each batch of cheques is printed, the status of the batch will indicate printed. After all cheques are printed and accepted, select the After cheque production button, and print out the General Ledger summaries & cheque registers. After the cheques registers have been printed, you can select the button to delete the batch. When you highlight your batch and you see a Print icon as well as a delete icon, then the cheque register report has not been printed, if only the delete batch button is available, then all of your steps are complete, you will notice the batch status says complete. Make sure you do print the cheque register and accept it before deleting the batch, otherwise the cheques processed will not be recorded in history reports. Select the Reversal Button, the cheque status will change to reversed. There is no un-reverse, so we recommend that you do a backup of the database before reversing cheques; and take a moment to verify that you are reversing the correct cheque number. Once the program has been installed, what are the next steps? To log into the program for the first time, you will have to sign in as the Administrator. Use the User ID and password provided by Abenaki. Once logged in go to help then register and key in the serial number provided to you by Abenaki. 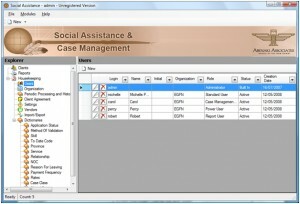 From the Explore menu (left panel), select the Organization menu option and then select the New button under the work organizations in the window on the right. Complete the general information screen and save. Complete the batch production screen and save as well as the EFT production screen if required press save and close. Next setup each type of user. To access the user maintenance screen for the first time you must be signed in as the administrator user. 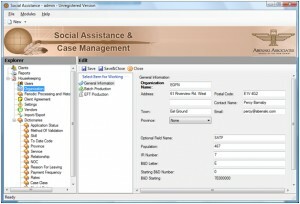 Create at least one Power user and one Standard user to perform functions in the program. Exit the program. Log in as the Power type user you just created in step 4. Customize / Modify the dictionary items; these dictionaries can be modified by the Administrator or power user. 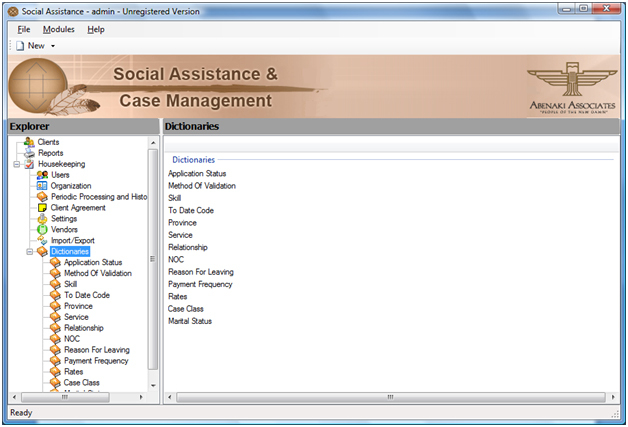 These dictionary items will be available in different sections of the Social Assistance module for the standard type user. Many of these dictionary lists have values already assigned, but can be added to at any time. These dictionaries are a way for you to customize the module to meet your requirements. Once the dictionaries are setup, exit the program and long in as the standard type user to begin entering clients. These would be the minimum reports to print. 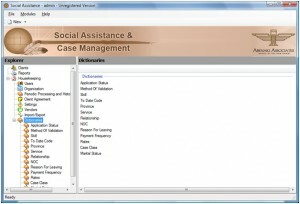 Your Social Services Module offers over 80 different report types, such as clients lists and graphs. We suggest printing all of the reports on a regular basis and decide which ones you would like to incude as part of your Month End Process. BACKUP YOUR DATA - We can't stress how important this is. Backing up your data on a regular basis will save you both time and money in the long run. 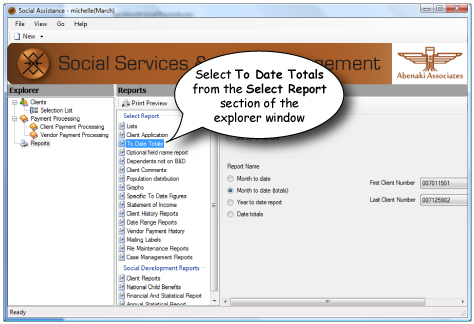 Have the Administrator or Power user sign in and run the clear Month To Date totals function from the Periodic processing menu. Select the Run button to run the function. When you exit the screen, you must select Yes to save your changes. 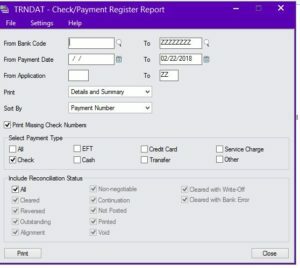 The pre-cheque register is missing some clients, what can cause this? Verify that the client’s status is active or active guardian and there is a cheque mark in the process this client field. Verify that the client has payment details for the payment frequency that you have selected. What are the payment processing steps? Log into the program as the standard type user, once you entered all the clients including B&D and payment details you can begin payment processing. Go to client cheque processing under the payment processing menu option in the explorer window. Select the Process Button. This will generate a Pre-Cheque register report on your screen. You can print the report and review before proceeding. Please note if this is not your first cheque run, your first step may be to reinitialize the B&D’s. This will start a new B&D form for each client you have selected to use recurring B&D forms for. 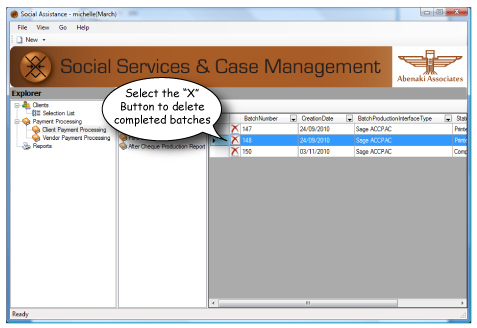 Click the create batch file icon; which will only be available if the pre-cheque register report contains no errors. The icon is located next to the process button. After creating the batches, the second step is to select the print cheques button and then the print button above. You will be asked to input a starting cheque number. This number should match your pre-printed and pre-numbered cheques. Once you enter your starting cheque number, the cheques will be printed on your screen. Select the printer button to direct your output to the printer. You will have to repeat these steps for each of the batches created. What is the difference between the Admin user and the Power user? The Administrator can create & delete users, change dictionary items for any organization and create organizations. The Power user can create & delete users & clients as well as change dictionary items within their organizations. When setting up an organization for the first time, why can I not choose a province yet? If you have not customized the dictionary items for provinces, there will be nothing to choose from in the drop down list. While logged in as the power type user, to add a province, select provinces form the Housekeeping menu option. Select your organization (in place of default), and select the new button. Type the name and abbreviation for the province or state; the description field can be left blank.